Alcmene was a granddaughter of the hero Perseus and wife of Amphitryon in Greek mythology; Alcmene though is primarily known as being the mother of the demi-god Heracles. Alcmene is normally considered to be a granddaughter of Perseus and Andromeda, born to Electryon and Anaxo, though some say that Alcmene’s mother was actually Lysidice, a daughter of Pelops. Electryon was the king of Mycenae and Tiryns, and as well as Alcmene, Electryon was said to be father to 10 sons by his wife, and one illegitimate son, Licymnius. Alcmene grew up to become one of the most beautiful women of the day, but with this beauty also came wisdom, and it was these traits that saw Amphitryon come to Mycenae in order that he could make Alcmene, his cousin, his wife. The time of Amphitryon’s arrival in Mycenae was a troubled one, and the sons of Pterelaus were in dispute with Electryon, for the sons of Pterelaus laid claim to some of the kingdom of Electryon. Rejecting their claim, a battle would erupt between the sons of Electryon and the sons of Pterelaus, after Electryon’s nephews had driven off the king’s cattle. During the battle, the sons of Electryon, bar Licymnius, and the sons of Pterelaus, bar Everes, were killed. Amphitryon would retrieve the stolen cattle, and in gratitude, Electryon agreed that Amphitryon could wed Alcmene, and also Electryon was to leave Amphitryon in charge of his kingdom, whilst the king sought retribution for the death of his sons. Before Electryon could depart, the king was accidentally killed by Amphitryon, when a club bounced off one of the stolen cattle and hit the king. Despite being an accident, Sthenelaus, a brother of Electryon used it as an excuse to take the throne, and Amphitryon was sent into exile, and Alcmene went with her intended. Alcmene and Amphitryon would arrive in Thebes during one of the periods when Creon was on the throne, and King Creon would absolve Amphitryon if his “crime”. Alcmene though, refused to marry Amphitryon until he had avenged the death of Alcmene’s brothers. After much work, Amphitryon would leave Alcmene in Thebes, whilst he went to war with the Taphians and Teleboans, the peoples connected with Pterelaus and his sons. Now the beauty of Alcmene also attracted the attention of Zeus, and so Zeus came to Thebes to have his way with her, the very day before Amphitryon was due to return. Zeus would disguise himself as Amphitryon and would return with news of his victory at the war and trinkets from it. Alcmene was convinced that Zeus was Amphitryon, and that night she would sleep with the god. Zeus would of course make Alcmene pregnant; and some would say that Alcmene was the last mortal woman that Zeus ever slept with. The next day Amphitryon returned, and also slept with Alcmene, and also made her pregnant as well, but Amphitryon was worried when Alcmene told him that he had already returned the day before. Amphitryon would find out what had happened from the seer Tiresias, although the news did not comfort the hero greatly. When it was close to the time for Alcmene to give birth to the son of Zeus, the supreme god made a proclamation that a descendent of Perseus was to be born on a given day, and this boy would rule over Mycenae. Hera heard the news, and greatly angered by her husband’s infidelity, decided to use her husband’s proclamation to her own end. 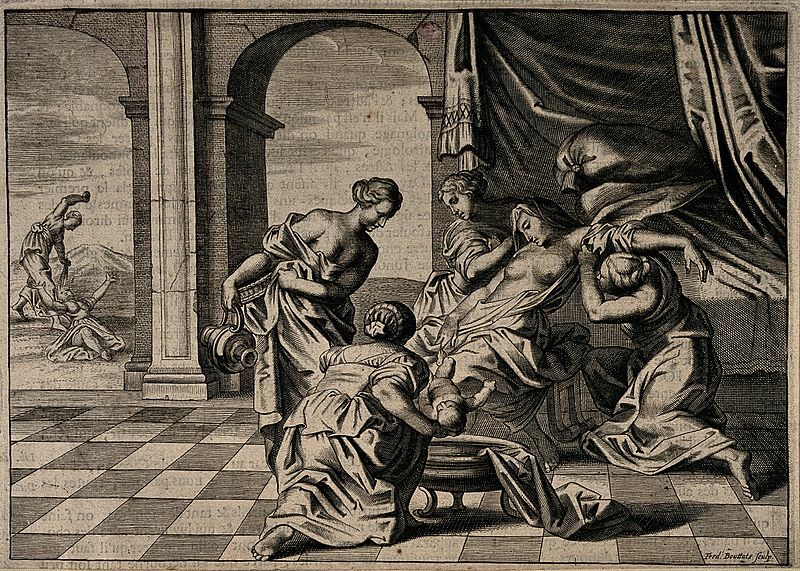 Hera would instruct Ilithyia, the Greek goddess of Childbirth, to stop Alcmene from giving birth, and for seven days and seven nights Alcmene was in pain as she tried to give birth to her son. At the same time Hera induced the wife of Sthenelaus to give birth early to her son; and so at only seven months into her fall term, this wife gave birth to Eurystheus. Thus, according to the word of Zeus, it was Eurystheus who was to rule Mycenae. And still Alcmene had not given birth to her own son, and if Hera had had her way, she never would have, but for the intervention of Galanthis, a handmaiden of Alcmene. Galanthis realised that it was Ilithyia who was hindering her mistress rather than helping her, but Galanthis went up to Ilithyia and told her the lie that Alcmene had given birth. The news jolted Ilithyia so, that the goddess lost concentration, and so Alcmene gave birth to the son of Zeus. Originally this son was named Alcides by Alcmene and Amphitryon, but later in an attempt to try and pacify Hera, the name was changed to Heracles, meaning “Glory of Hera”. Born to Alcmene, the night after Heracles, was of course Iphicles, a hero often found in the company of his brother. Some also say that Laonome was a daughter of Alcmene and Amphitryon; Laonome subsequently marrying either Polyphemus or Euphemus, both named Argonauts. Alcmene and Amphitryon were fearful of the anger of Hera, for now both were convinced that Alcmene’s first born was the son of Zeus. It was decided that Heracles would be exposed in a field outside of Thebes, but before any harm could come to the babe he was found. The finders though were not hunters nor shepherds, as was the norm in such cases, but Heracles was found by Athena, and possibly Hera. Taken by the child, Athena, perhaps out of mischief, persuaded Hera to suckle the child, Hera of course being unaware of whom the babe was. Athena would then take the babe back to Alcmene, commanding the wife of Amphitryon to raise her son. Amphitryon and Alcmene would raise their children well, but when Heracles was still a teen, Alcmene became a widow, for Amphitryon died in the war between Thebes and the Minyans. Alcmene would subsequently remarry for she would wed Rhadamanthys, the son of Zeus and Europa, and Alcmene would live with her new husband in Ocaleae in Boeotia, for Rhadamanthys had been exiled from Crete. Some tell of how Rhadamanthys continued the education of Heracles, especially in the skills of archery. As Heracles became more famous, so stories of Alcmene dwindled, and it was only after the death of her son that Alcmene was once again talked of. King Eurystheus was now hunting down the children of Heracles, to end all future threats to his rule. This persecution though would ultimately lead to the death of Eurystheus, for having found sanctuary in Athens, Hyllus, a son of Heracles, would venture out and kill the enemy of his father. Having killed the king of Mycenae, Hyllus would cut off the head of Eurystheus and present it to Alcmene. Alcmene would then gouge out the eyes of Eurystheus with weaving-pins, for Alcmene’s anger at Eurystheus had built up over a number of years, for Eurystheus had usurped the birth right of her own son, had persecuted Heracles in his lifetime, and had continued the persecution of Alcmene’s descendant afterwards. It was said that Alcmene herself would die of old age, possibly in Thebes, or possibly at Megara, as she walked the route between Argos and Thebes. It was said by some that Alcmene would be buried in Megara, and for centuries afterwards there was said to be the tomb of Alcmene at the Olympieum, but others said that the body of Alcmene was not present to be buried. In this case it was said that Zeus had Hermes steal away the body, replacing it with a statue, and that Hermes transported Alcmene to the Islands of the Blest, where Alcmene was reinvigorated and became the eternal wife of Rhadamanthys.